During years you have traveled extensively, reading a lot, doing all sorts of jobs, do you consider traveling and close range experience a fuel for your poetry? Can you go back to the roots of your poetry? Anything you do can be poetry if you are a poet. Any form of activity is truly vital, for writing, for the spirit, the drive of existence itself. We are all travelers in a way, into emptiness; the poet travels fully awakened and digs everything, derives from everything, pushes his way ahead with all the forces he has gained since he became a man of knowledge, that is, a lover of life. The roots of my poetry go back to the lives and poems of other men, to their vivid interactions with the phenomenon called reality; since the days of the unknown antiquity. I remember that I wrote my first poem in the last page of my pad, in high school; and it was a brute attempt to scribble down something that I had no idea what is was, what I wanted to say. It was the action amidst all this necrophilia in the classroom that I longed for: I wrote my name a few times in a line, gave it to the teacher and I went out quietly leaving the rest of the class cold and speechless. Your recent poetry book will soon be published in France, you have been published in US. Good poetry, as we see, and contrary to some expectations, still exists in the world today. Do you think that there are favorable and not favorable times for poetry, or is it always today, and endurance of poetry is not to be underestimated? Not exactly; my recent book of poems is a collection of previously unpublished poetry of the period 2001-2009, called “Ati”; that accompanies in a way “The Margins Of A Central Man” a sum of poetry in english that came out in Kolkata, India, in 2010. In France there is an unexpected interest from some editors to publish my long, extended poetic synthesis called “La Chope Daguerre” which I wrote in Paris and its outskirts a few years ago. Michel Volkovitch is now translating it. There is also something that will come out soon, a surprise. I will let you know. The human history would be a clear zero if there was no poetry. The whole history of man is a series of forgiven and un-forgiven mistakes; needful and needless risks. Poetry is the epiphany of truth; of absolute beauty; the energy that proves that everything is an illusion. The difference between the poet and the not-poet is that the poet embraces it all, lives it to the full and stands upright before death because he understands what it seemed that was made not to be understood. I have written an essay where I explain my thesis on poetry and the poet; by the way, it just published a few days ago in a literary review in Greece. Anyway; Poets are very few in the world today, there may be thousands of people called poets but they are just names; the signature of the poetic spirit is missing. What about the importance of reading? Is it essential for a poet to create his own approach to language, a unique form of expression? 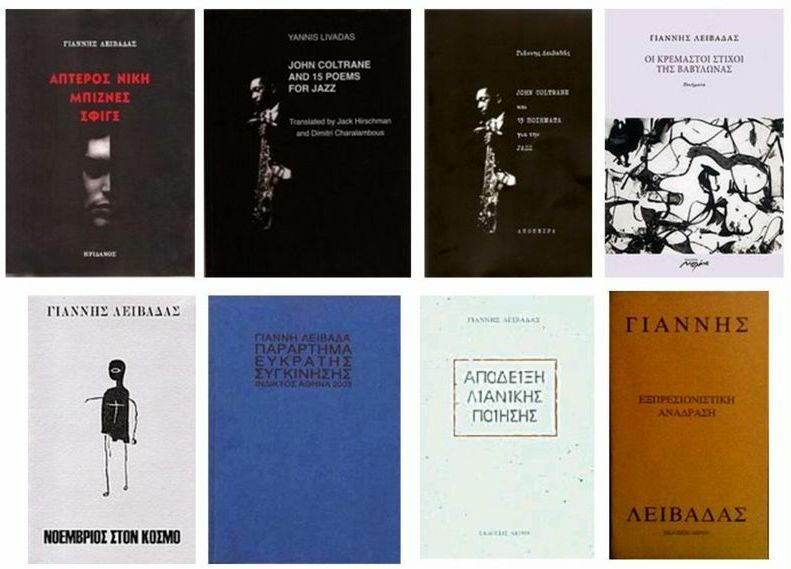 Can you give us a few hints what goes on in contemporary poetry of Greece? Reading contributes seriously. Above all, by reading the best of the kind you see the best of the mistakes and so you can avoid them. But I think that is a natural danger in reading. If you are not reading the best writers you will get ill. That illness called mediocrity; and shoots you right in the head. The real poet is he who offers the most serious mistakes, who writes by constantly risking his language, that is, his uniqueness, his signature. Poetry is uniqueness or nothing. As I have said many times before; Greece has a broken leg yet runs in the races; the whole situation here in real life, in ethics, in literature, is harsh and declined. I have turned my back to it. Blaise Cendrars said that language is not something dead, frozen, but something in motion, fugitive, attaching itself always to life and reality ... what is left from his legacy? Is poetry nowadays attached to life and reality, or misplaced to not easily approachable location? Cendrars was absolutely the greatest poetic spirit of the twentieth century; that is unquestionable for a man like me. His legacy I presume is here, alive and kicking; because, what the hell! Cendrars’ legacy is poetry itself! Poetry today continues to express itself everywhere; in many forms, in many places, in moving and not-moving. The matter is if one can be a creator; a poet who creates a poem; not just someone who writes a poem. If one realizes that difference becomes automatically a poet, not a man who simply writes down the cheap throes of his negativity. Once upon a time the poet was a wanderer, and a good poem was a voyage to unknown ... is a poet and poetry tamed, so to speak, being overly institutionalized, out of reach, vegetating in university libraries-laboratories, handy tool for acquiring the scholarly or intellectual career. Also a kind of circus, shown on festivals, but mostly as an exposition of endangered species. Can you say something about importance of poetry in everyday life, and importance of everyday life in poetry? Can a poet be truthful if he doesn’t dive deeper in the currents of life, deep enough that he can touch the riverbed with his fingers, as Cendrars did? In accordance to my answer above; poetry was never and will never be institutionalized, or out of reach, or will ever be cultivating as a cabbage of foolery. Also poetry, the poet, is not an endangered species; the few dozen poets of every century are more than enough for all humankind; the “galore” of poets is a matter of the trade of poetry, the whole publishing industry worldwide that sells garbage for culture, poetry, etc. That industry maintains and supports strongly its products. Festivals and universities also do the same. The facts speak for themselves. So, according to your question; the poet is a diver, is a miracle-man, a constant wanderer, an outsider and an insider, an innovator. Sometimes reading a good poem can take a person to a place already visited, but only vaguely, in hers / his imagination, and now everything opens fresh and clear, scattered impressions become united ... you are a valuable translator of poetry, what is your opinion on importance of translating poetry, primarily for you as a poet, and for culture in general? Translation is quite a trial; but I believe it is essential for transmuting and communicating poetry in other languages. And is wonderful too as a literary exercise. Sometimes it’s like you have a direct contact with the poet himself. You are messing with his peculiarities. Poetry travels the world through the works of the translators; that is a big deal, really. Poetry, ever since the days of Gilgamesh 5.000 years ago, has been one of the strongest forms of human expression. Is it correct that true poetry from the past is an estate that we inherit, and thus should behave like gardeners? It is somehow like what is happening right now, while I am answering to your kind questions; to speak from the depths of my spirit I must speak greek; but if I speak greek that would be a serious trouble for you. I am Gilgamesh and you are the 5000 years; we must create something like a bridge between us. Basically; not a bridge, we just need a rope, stretched from the one edge of the spirit of mine to the edge of the spirit of yours. Always at stake. Poets are the molecules of spiritual danger; there are no gardens, no gardeners; poetry springs into nothingness.